The market week in Jokkmokk is an extraordinary happening. Already several weeks before the market the whole community start to vibrate of activity. The snow gets out of the way from the streets, planning for the market stalls starts, the tempo gets higher and the people are full of expectations. The first visitors starts to come already the weekend before, fully dressed in fur hats and thick down parkas. Many people come back year after year. It seems like it become addictive and you want to come back and meet old and new friends, the meetings with all the great people are one of the greatest things. Jokkmokk has always been a natural meeting place for people from near and far. The market area in it self is not the most important. Except from all the people you meet it’s also about all the interesting lectures, dances, the sami joik concerts and the art and handicraft exhibitions etc. 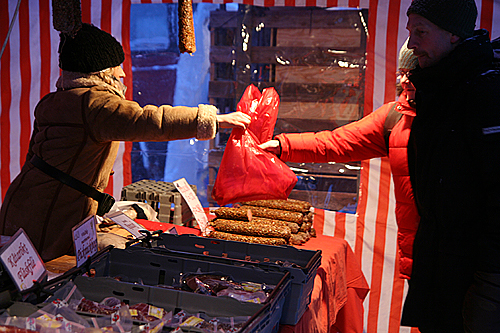 Jokkmokk wintermarket, a uniqe market with a history of more than 400 years. We offer dog sled tours during the Jokkmokk Winter Market. With help from our colleagues we try to do as many tours as possible. Even so, we are often fully booked. During Jokkmokk Market we limit our dog sled tours to 3 hour tours and Northern light tours. Monday 4th – Sunday 10th Feb. Together with our local Sámi reindeer herders we also offer you to join them into the forest and take part of their daily work with the reindeers. Help to feed the reindeers and get an insight in the life of a reindeer herder and about Sámi culture. A unique opportunity you don’t want to miss! Daily tours from Monday 4th – Sunday 10th Feb. Follow reindeer herders and take part of their daily work by feeding their reindeers on their natural winter pasture land. Around the flaming fire, you will be served coffee with a something to eat while you will get an insight of a life of a reindeer herder and about Sami culture. We recommend you to book accommodation already now!